The devastation of hurricane Sandy has people pointing to Global Warming as the culprit. Natural disasters spur the discussion on what we can do to stop climate change. What if the causes are so big that we can’t do a thing about it? 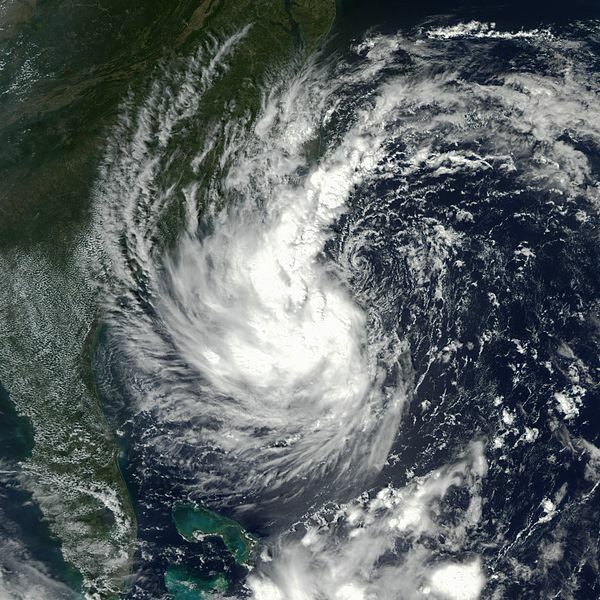 Tropical Storm Gustav is hovering off the coast of Georgia and the Carolinas in this true-color Moderate Resolution Imaging Spectroradiometer (MODIS) image from September 9, 2002. Human activity has been pegged as the cause of global warming. Pundits say the generation of green house gases (GHG) traps the infra-red rays in the earth’s atmosphere and is heating the planet up. Concerned people and groups are rallying their calls to curb our appetite for oil-based fuel and beef consumption (cows generate lots of GHG). There are debates as to whether this is truly the cause or is significant at all. Is humanity really the cause? Are we really so arrogant to believe that we are the source of all that affects the earth? Scientists point to the correlation between GHG emission and global temperature rises as the proof. But isn’t that like saying that there is a positive correlation between ice cream sales and drownings? Ice cream sales do not cause drownings – they just both occur during the hot summer season. I am leaning towards the idea that there are bigger forces at play that we can’t affect. The earth’s axial tilt is changing. Axial tilt is the angle at which the earth’s axis is relative to it’s orbital plane and current is 23.4 degrees. But is it moving and accelerating. During the 20th century, it moved 1100 km, and since 1970 its has accelerated from 9 km/year to approximately 41 km/year. 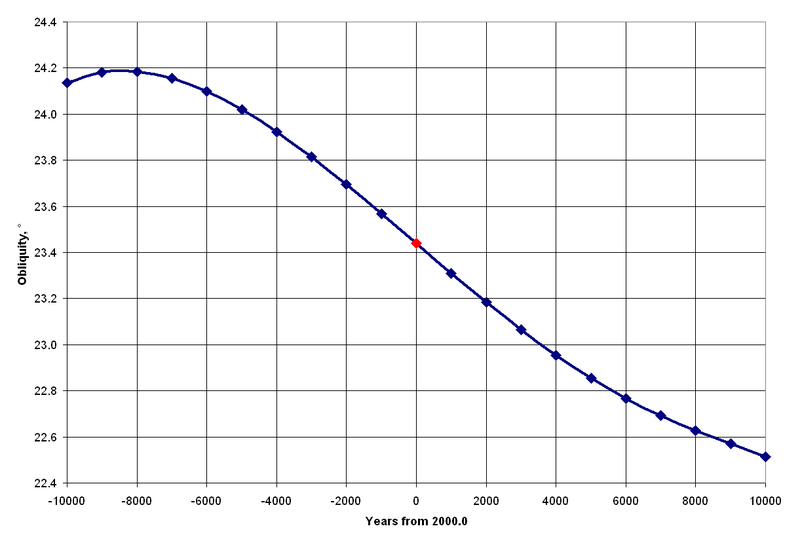 The change in axial tilt over the last 10,000 years corresponds to the decline of the last ice age and the current warming trend. The graph below suggests that since the dawn of mankind, the world has been warming. Perhaps early humans migrated from Africa because it got too hot. With the rate of axial tilt increasing so will the rate of global warming and affects on climate. We are in no position to affect these global forces. It may be a fatalistic view – but I see no way for us as humanity to change this. Decreasing GHG emissions and other measures are good for humanity as a matter of sustainable stewardship. It is not helpful in adapting to the inevitable changes in climate brought about by axial tilt. Charles Darwin’s phrase of “survival of the fittest” is meant to be “better adapted for immediate, local environment”. Today, species are disappearing because they cannot adapt to the shifting climate. The focus of climate change research could be on survival as a species by adaption. We need to prepare for more hurricanes like Sandy, droughts and seasonal disruptions as it related to our current society and economies. We need to change our farming practices and living conditions to meet this reality. We must adapt to the changing global environment. Previous Stop Telling Me I’m a “Bad Dog” !